We pride ourselves in our ability to deliver the most excellent and rare pieces with competitive pricing which others cannot offer. This watch features: Stainless steel case with brushed & polished finishes. Polished black ceramic bezel with a ridged edge. Case center (edge) lateral black Kevlar inserts. Crown & chronograph buttons have rubber centers/inserts that match the black Kevlar. 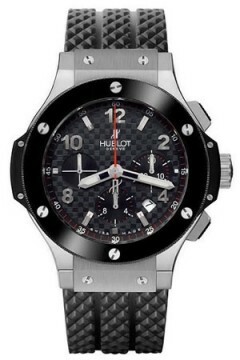 Black dial with a stamped carbon fiber pattern. Applied brushed finished steel "applique" style Arabic Numeral & Index hour markers.